There are hundreds of problems that can happen in a Windows computer. Each user might have his or her own opinion on which one is the worst but for is here in WindowsTechies, the problem that we consider to be the worst is losing all files after the whole system is corrupted by a strong malware or virus. This can even get worse towards the next level of being worse if the files that you’ve long treasured and protected in your Windows machine cannot be recovered anymore. All of us have experienced this after a reformat or clean install process has been done on our laptops and PCs but little do people know that Microsoft actually created tools for protecting users from ever suffering the worst nightmare that can happen anytime. We have shown the tools that are available in Windows 10 that will help you prepare for the worst in our previous tutorials. 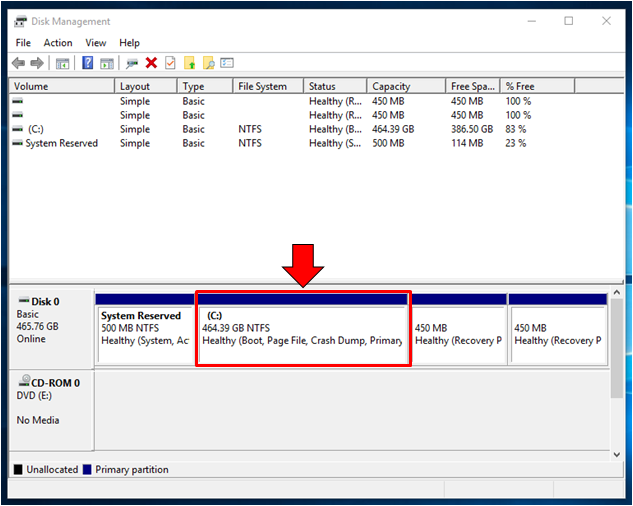 They are called the System Recovery and System Image/Backup and Restore tools and if you have read them, you should have encountered a section where we mentioned about “drive partitions”. Yes! in order to fully take advantage of these tools, you will need to at least be able to create one drive partition which will serve as the storage for your backup or system image files. But how are hard drive partitions created? What are the steps involved? If you wanted to follow the steps that we’ve shown in our previous tutorial but you stopped in the middle because you don’t have a hard drive partition/external hard drive with you then you we’ll help you create one (drive partition) with at least 80 GB of storage space. 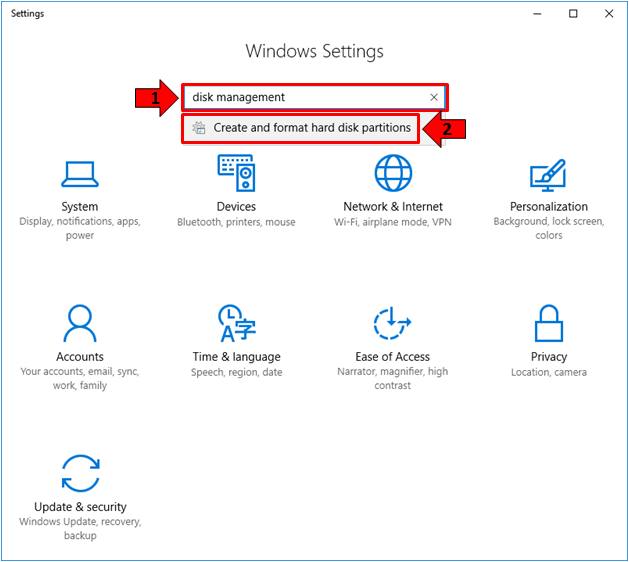 Just follow the steps that we are going to show in this tutorial in order to successfully create one hard drive partition in your Windows 10 machine. Different tools have different ways of being accessed on your Windows 10 machine. The same is true with the Disk Management tool that is built within the Windows operating system. There are varied ways in accessing this handy tool and we’re going to show each one of them in this tutorial. 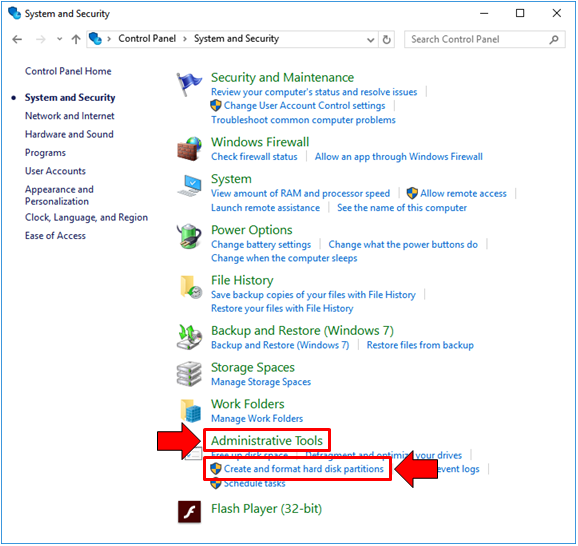 One of the simplest steps that you can use in opening the Disk Management tool is by clicking on its link that is found on the Admin menu also known as the WinX menu. In order to open this tool, all you need to do is press the Windows + X keys and the tool will appear instantly on the bottom-right portion of your computer screen as you can see being shown below. 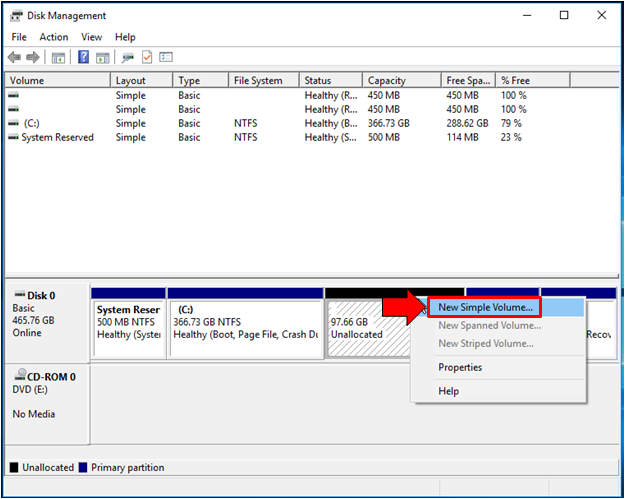 Just after clicking on the link, the Disk Management tool should launch almost instantly and you should be able to see all available hard disk drives on it that you can create partitions from. Now, if you love doing things the traditional way then you can access the Disk Management tool from the Control Panel. If you are having trouble finding the shortcut or link that will launch the Control Panel Window then you don’t need to panic about it being lost or unavailable because all you need to do is to one again access the WinX menu as we have shown above. Just press the Windows + X keys and the menu should appear instantly on the bottom-left portion of the screen. 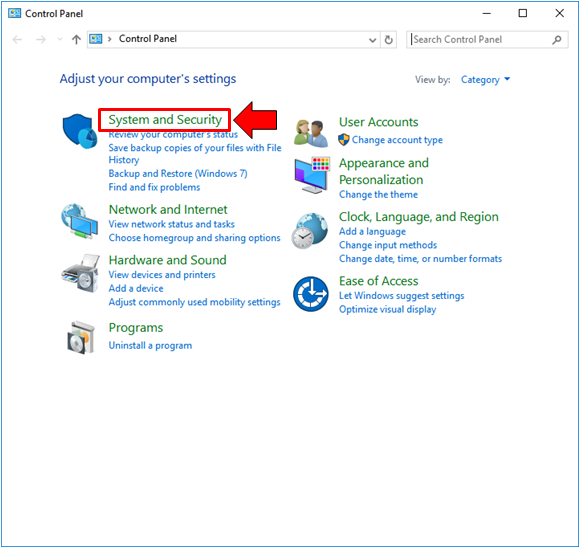 From here, simply click on the link that says “Control Panel” and the traditional settings section of Windows should open right away. Now, on the Home screen of the Control Panel Window, just click on the category that says “System and Security” as you can see on the screenshot below. After clicking on the category, you should be able to access the section which shows its contents and from here, you will need to click on the subcategory that says “Administrative Tools” in case you still want to explore some other stuff that are available under it or you may also open the “Disk Manager” tool right away by clicking on the “Create and format hard disk partitions” link found under the “Administrative Tools” subcategory. In case you chose to click on the former (Administrative Tools category), you will be taken to a Window that looks exactly like the one being shown below. As you can see, there is a long list of tools listed in alphabetical order but if you don’t want to stress yourself much then you can simply click the latter (Create and format disk partitions) option as described earlier. The screenshot below shows the “Computer Management” tool shortcut which you need to double-click in order to access the “Disk Manager” tool. The Computer Management Window will then launch and in here, you will see the usual setup of a Window where there is a navigation pane at the left containing links or shortcuts that leads to the different tools that are used to manage your machine. From this pane, you’ll need to click on the shortcut that says “Disk Management” and voila! The tool should open on the same Window right after it initializes. Lastly, we will come to another easy method in launching Device Management tool and in order to do so, you will first need to open the universal Settings app. In order to do this quickly, all you need to do is press the Windows + I keys and the Settings app Window should open in an instant! Once the universal Settings app opens, you will be able to see 9 setting categories but this time, we will not be clicking on any of them. You will just need to focus on the Search box that is found on the top-center portion and in here, you will simple need to type the words “disk management”. After typing in these couple of words, you should be able to see the “Create and format hard disk partitions” shortcut appearing as a search result/suggestion just below the input box as you can see on the screenshot below. After you click on the search result suggestion as we have shown above, the Disk Management tool should launch almost instantly and you will now be ready to create a hard drive partition which we will be talking about next! 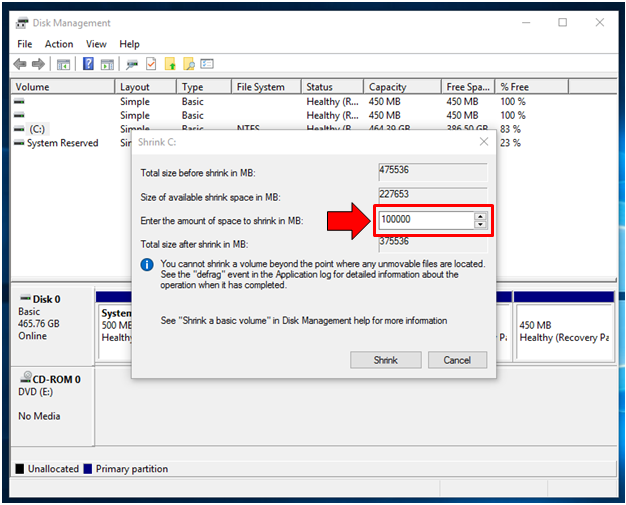 In one of our previous tutorials, we’ve shown how to create a System Image also known as a backup in Windows 10 and it required a hard drive partition that has at least 100GB of space so in this tutorial, we will be showing you how to create a partition that has this amount of storage space in it. To start, you will first need to know the drive letter of your machine’s hard drive. It is designated as drive C: if you haven’t changed the drive letter and if you only have a single partition where the operating system is installed. To start, you will need to look into the bottom portion where the label “Disk 0” is found and to the right of it, simply look for the box that is labeled “(C:)” as you can see being highlighted on the screenshot below. After finding drive (C:), all you need to do is right-click on it in order to access a contextual menu which shows the different options that you can do to the drive. 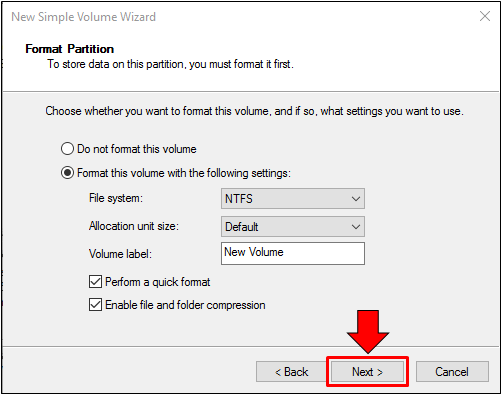 Since we are trying to create a new hard drive partition, what we’ll need to click is the option that says “Shrink Volume” as shown below. 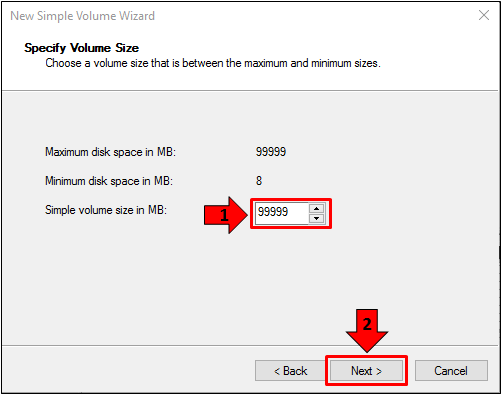 After clicking the shrink volume option, the Disk Management wizard will show a prompt that says “Querying volume for available disk space, please wait…”. This would just take a few seconds and after it is done verifying the available space, the “Shrink C:” wizard will open showing the available size before shrink, total size available for shrinking and there’s a box below it where you can enter the space that you want to create for the new hard drive partition. Since we want to create one that has 100 GB of storage space, all we need to do is enter 100000 into the box since it asks the size in MB. After entering the space desired for the hard disk partition that will be created, you can now click on the button that says “Shrink” found at the bottom-right portion as you can see on the screenshot above. After you do so, the tool; will apply the shrinking of your existing drive and once it is done, you should be able to see a new box under “Disk 0” which has a black bar above it and is labeled “Unallocated” and the space is not really 100 GB. It is just 97.66 GB since a few megabytes were used for required system files for it to be created. If you check in File Explorer for the available drives, you will not be able to see this space yet since it still has to be formatted so it can be used. However, drive C: should have already been shrinked and the available space in it is already smaller or less 100 GB since Disk Management has already separated that space from the drive. Now that you’ve successfully separated a total of 100 GB from the existing drive (Drive C:) you will now need to format it so it will appear as a new partition when you check for the available drives in File Explorer. 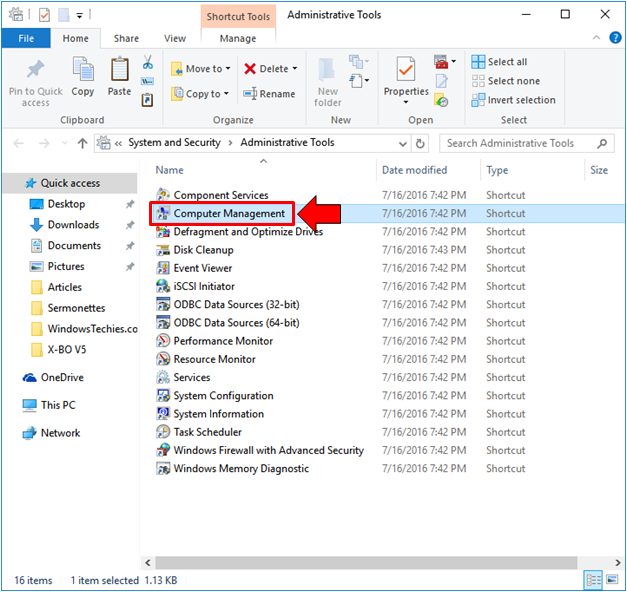 To start, you will first need to right-click on the unallocated space shown in the Disk Management tool Window in order to access a contextual menu which shows the options and actions that are available for the drive. 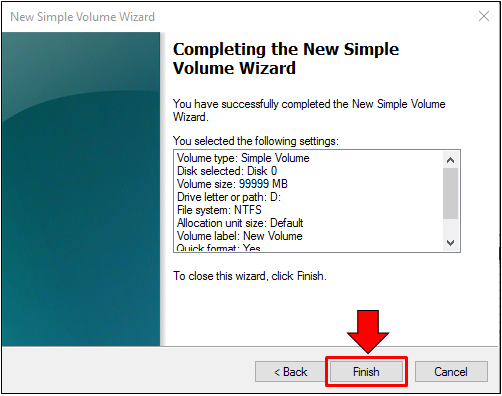 From these options, you will need to click on “New Simple Volume…” as shown below. 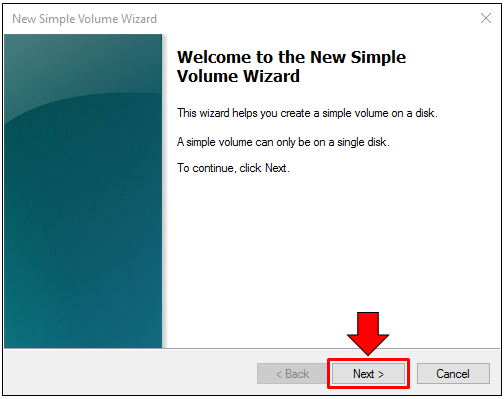 After clicking on it, the New Simple Volume Wizard will instantly launch and from here, simply click on the “Next” button which is found on the bottom-right portion of the Window as shown on the screenshot below. The next step will then ask you to enter the desired amount for the new simple volume that is going to be created. The total amount of space is already in the box by default but if you want to enter a smaller space value then feel free to do so by entering it into the input box then afterwards, just click on the “Next” button that is found at the bottom-right portion. Next, you will be asked to assign a drive letter or path. Since we are only creating a basic partition, you don’t need to change anything on this Window. 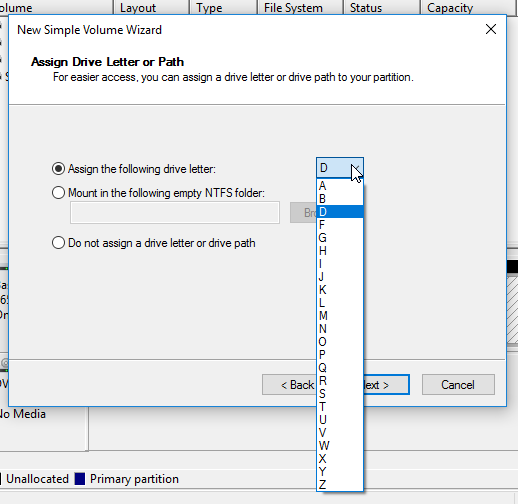 The new drive will be labeled as “D:” by default but you can change this to other letters of the alphabet except C: since it is already being used by the existing drive. To choose a new drive letter, just click on the drop-down box which contains the default one assigned to the drive as you can see on the screenshot below and choose the one that you want. After choosing your desired drive letter, all you need to do is once again click on the “Next” button that is found at the bottom-right portion of the Window in order to proceed to the next step. The Window that comes next will then ask you to format the partition. Again, the default options that are selected already works great so just click on the “Next” button that is located at the bottom-right portion of this Window to initiate the formatting of the drive. Finally, you will come to the last step which shows the information that you have set and selected in the previous steps. You can check these settings for the new drive in order to make sure that everything is what you really want to create and after making sure that everything is good, simply click on the button that says “Finish” as you can see on the screenshot below. After clicking on the “Finish” button, the drive will then be created and you should be able to use it right after. In other cases, you may need to reboot your computer in order to make the changes final and we would recommend that you do so in order to arrange everything well for the newly created drive. 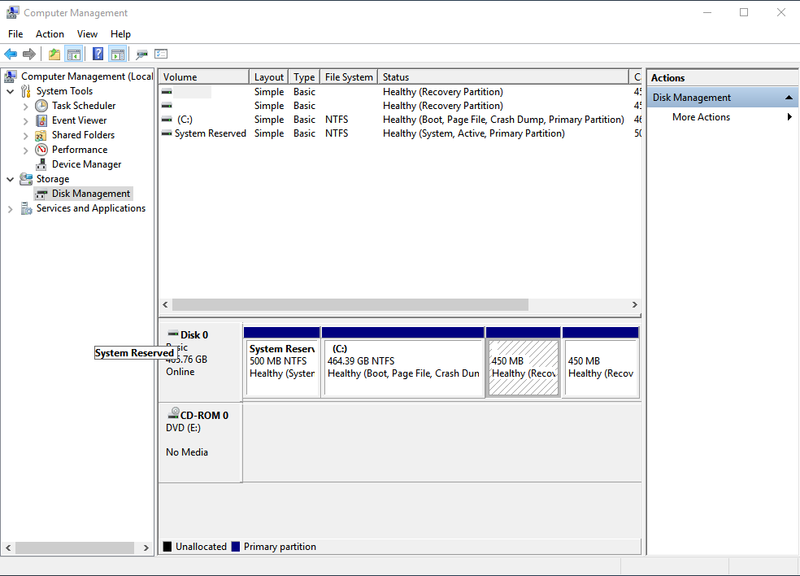 Why Create a Hard Drive Partition? Dividing your hard drive to different parts is a good thing to do especially if you are trying to protect some stuff from being corrupted along with your current or existing hard drive space where the operating system is installed on. You can also create a hard drive partition to be mapped as a network drive in case you don’t like other people to be able to access your personal stuff that might be stored in folders and libraries that are shared by default when you map your existing drive on a network. Other cases that warrant the creation of a separate hard drive partition is when you want to save a system image or a backup drive for your computer which you can use in case things gets worst and your machine refuses to boot up normally as we have shown in this previous tutorial. 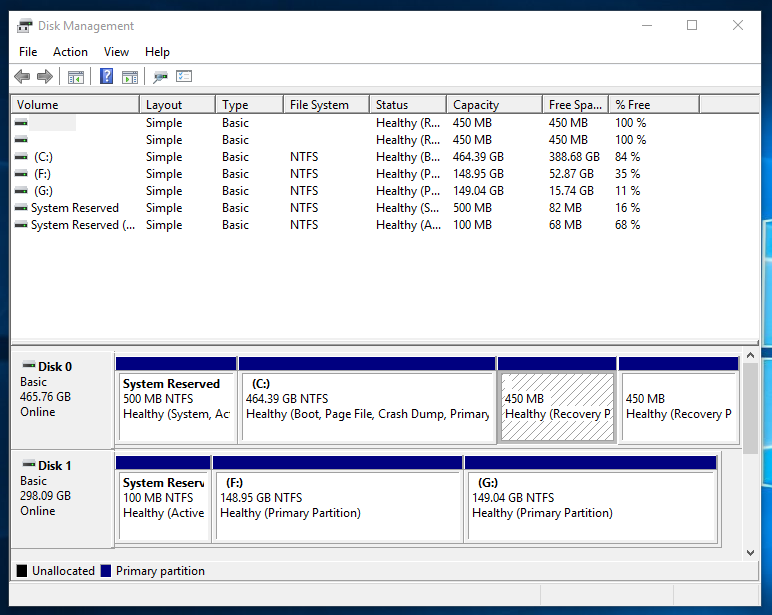 Have you ever tried creating a hard drive partition on your Windows 10 machine? What sort of problems did you encounter and how were you able to solve it? You might want to let us know your thoughts so we can help you with it. Our community of Windows-loving earthlings might also have some suggestions that will help solve the trouble that you are having on your computer. We are also open for any topic suggestions. If you have some questions running in your mind about Windows or you want to solve a problem and you didn’t find a tutorial in our website that shows how it could be solved then please feel free to submit it as a topic suggestion to us by taking advantage of the comments section below.